Even if you're not fond of the colder seasons of the year, you have to admit that the food and drinks that come with winter are some of the best. From tasty seasonal desserts to full on meals, the fall and winter are jam-packed full of amazing things to eat. Even your dog has more tasty treat options during the winter. When it comes to drinks, the same is true. 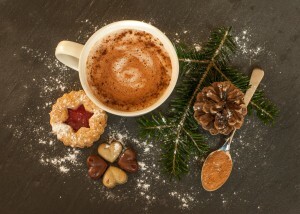 There's no better time for seasonal treats like hot chocolate and other warm drinks. To learn how to make some of the most popular fall and winter drinks, continue reading. Hot chocolate is a classic that just about anyone can get behind, especially on a chilly night. While this classic is easy enough to make, variations of it can be just as easy to produce. To give your hot chocolate an extra kick of flavor, check out this recipe for peppermint hot chocolate. 1. Grab a medium saucepan and heat up your two cups of milk over medium-low heat. Let this heat up until small bubbles start to develop around the edges. 2. While you wait for the milk to heat up, grab your peppermint patties, open them, and chop them up. You don't want to chop them too small. When they're coarsely chopped, add them to the milk and whisk this mixture until the peppermint patties has completely melted. 3. Your peppermint hot chocolate is ready to serve! Grab a couple mugs, pour in your hot chocolate, and finish it off with some marshmallows and crushed candy cane bits. This recipe makes enough for two mugs of hot chocolate, but you can always just the ingredients to make more or less. Welcome the colder seasons of the year with some cozy drinks and tasty treats to go along with them. If you just can't seem to get your baked goods perfect, you have nothing to worry about. Your neighborhood bakery, Great Harvest of Newtonville, has you covered. Call them at (617) 928-1162 to check out their yummy breads and desserts. You can also stop by Great Harvest of Newtonville to check out their bread and desserts. Although eggnog is a classic holiday drink, it can cause some controversy. The idea of a drink with eggs in it may not be the most appealing to those who didn't grow up with this classic, but you can always change their mind. For a classic eggnog that has a bit of a kick to it, check out the recipe below. Who knows, maybe you'll even convert an eggnog skeptic into an eggnog lover with this recipe. 1. Grab a large saucepan and heat up 2 1/2 cups of heavy cream over medium-low heat. Allow it to come to a simmer but don't let it get to its boiling point. 2. While you wait for the cream to simmer, grab a large bowl and whisk together the eggs, sugar, and salt. Slowly add in one cup of the warm cream while continuously whisking the mixture. Add of this mixture back into the saucepan with the rest of the cream. 3. Allow the mixture to continue cooking while you continuously stir it with a rubber spatula. The mixture should thicken after a couple of minutes until it is able to coat the spatula. 4. Strain your mixture into a large bowl using a fine mesh sieve. Let this cool for about 15 minutes while stirring it occasionally. At this point, whisk in the rum, whiskey, vanilla, and nutmeg. Keep in mind that you can reduce or increase the amount of alcohol in the recipe to your liking. 5. Grab your remaining cup of heavy cream and whisk this until you can form soft peaks with it. Fold it into the eggnog until it is completely incorporated. 6. Your eggnog is ready to serve! Use some of the extra nutmeg to garnish your drink. If you have any leftovers, these can be saved in the refrigerator for up to three days, just remember to which your eggnog before serving it. Don't have any tasty treats at home to accompany your drinks? Great Harvest of Newtonville has plenty for you to choose from! Give them a call at (617) 928-1162 to learn all about their delicious lunch options as well as their delicious desserts.